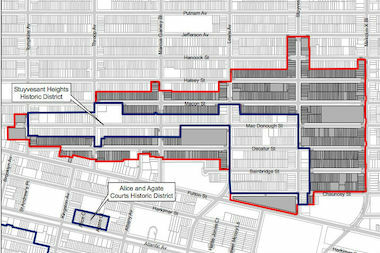 The expanded Stuyvesant Heights Historic District. BEDFORD-STUYVESANT — When Reno Dakota moved to Bed-Stuy from the East Village nine years ago, it took him some time to really consider the area his home. After leaving his old neighborhood of 23 years, he said he'd occasionally make his way back there for dinner or shopping and wonder why he ever left. But in those nine years, Dakota said the influx of glass towers and multimillion-dollar developments in the Manhattan neighborhood have left it a shell of what it once was. "I don't feel like I want to be there anymore," he said. "It's not the same place." Now the 55-year-old considers himself a proud Bed-Stuy resident, and says he's fighting to landmark his neighborhood so that what happened in the East Village doesn't happen in his new home. Dakota was one of dozens of Bed-Stuy residents on hand Thursday night to celebrate the expansion of the Stuyvesant Heights Historic District, a move approved by the city council last August after a decades-long push. Dubbed "A Celebration of One," the event, sponsored by Bed-Stuy's Community Board 3, featured a resource panel of officials to answer questions for newly-landmarked homes. Residents asked questions about new responsibilities, including maintaining landmarked property and the appropriate methods for making repairs, as well as how to deal with warnings and fines from the Landmarks Preservation Commission. It was an opportunity to showcase "the facts, not the myth" of landmarking, said community board District Manager Henry Butler. "There are a lot of things out there that have been said about landmarking," Butler said. "Most of it is not true." Opponents of landmarking say it stifles development and makes the city less affordable. A September study from the Real Estate Board of New York concluded that, "[d]esignating large swaths of Manhattan as landmarked districts has stifled the creation of affordable housing in New York City." Some at Thursday's meeting had their own criticisms, citing a fear of additional fines and regulations. One homeowner stood up to say she was hassled by the Landmarks Preservation Commission over the color of her home, despite having not painted it in more than 30 years. "We all love our beautiful Bedford-Stuyvesant," she said. [But] the benefits of having it landmarked I don't think outweigh the penalties." But supporters praised landmarking as a way to keep out garish high-rises and keep the spirit of the neighborhood alive. "I hope the rest of Bed-Stuy decides to do this," said Evelyn Collier, chair of the Community Board 3 Landmarks Committee. "It's a beautiful experience." That hope could soon become a reality. The Bedford Historic District, between Bedford and Tompkins avenues near Fulton Street, is already being considered by the Landmarks Preservation Commission. Other landmarking movements are also picking up steam, including Stuyvesant East, led in part by former East Village resident Dakota. The movement to landmark the neighborhood is good for the community's sense of unity, Dakota said. "Community is people and it is places, together," Dakota said. "Community recognizes its own surroundings, and that feeling of community is born partially from that."